I flipped through the new CB2 Catalog last night and was amazed at the amount number of cool new items they put out. 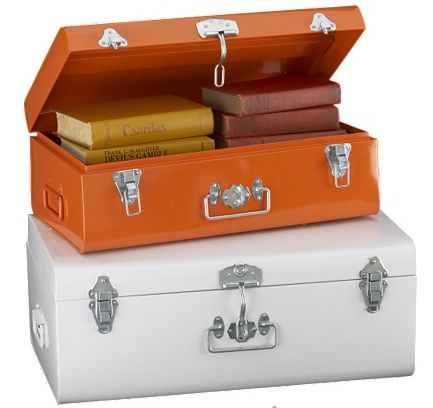 These Metal Trunks would make a nice little accesory in a kids room. Schoolmarm checking in again. It’s the number of cool things, not the amount. Amount relates to quantities of things that are measured in bulk; number to things that can be counted. Although I had a small amount of money, I still put a substantial number of quarters in the donation basket. I will try to limit the NUMBER of words I expend on it so as not to use up too great an AMOUNT of space! I still love your blog, kiddo! No hard feelings, I hope.